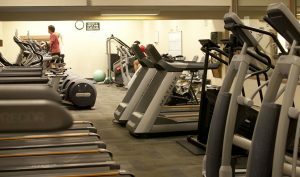 The Tucson Racquet & Fitness Club’s cardio room has just been updated with all new, state-of-the-art machines. Instead of purchasing all machines from one supplier, we chose the best offerings from the top performing manufacturers. We have 11 Matrix treadmills, 10 Precor EFX’s (elliptical machines), 10 Precor recumbent bikes, 3 upright bikes, 3 ESpinners, 3 AMT’s , 4 Stairmaster steppers, 2 Stepmills, 2 Concept 2 rowers and one Sci Fit UBE (upper body egrometer). Four large screen TV’s are available for your pleasure.